This Dart Solo UltraClear TP16D 16 oz. plastic squat cup is perfect for your serving needs! These 16 oz. cups create an enticing presentation and the short height makes it ideal for holding anything from refreshment drinks and cocktails at catered events, to fruit salads, or other appetizers. Its exceptional clarity not only presents an upscale appearance, but it provides product visibility, increasing appeal to customers as well as impulse sales. Constructed of virtually unbreakable PET plastic, this durable 16 oz. cup is crack-resistant, preventing breakage and ensuring customer satisfaction. Whether you're stocking your disposable drinkware supply in your cafe, kiosk, deli, or other venue, this Dart Solo UltraClear plastic PET cup is the economical choice that gives you functionality, durability, quality and satisfaction! These were used at my daughter's wedding for beer and soda. They are the perfect size and I love the crystal clarity of the cups. They are much nicer looking than the foggy clear cups and have a sturdier wall. Economical price too! Just regular plastic clear cups. No surprises. Quality is good and sturdy. Will be using these for my coffees. They go perfectly with the dart lids. We go through a ton of these in the summer time. Exactly what you see here - they are sturdy enough for whatever you need - but I would not recommend using them for hot beverages. Dart Solo is a durable cup with a nice sleek design. The Choice lids do not fit on these cups. Great to display colorful smoothies! Used at a beer garden for our carnival. Cups were nice and solid and held up well. Liquor board makes us use clear cups so we will be ordering these again. OUR FAVORITE cups are solo clear cups. thank you for offering these at an affordable price. these work better than the generic cups and no issues with lids. This is your basic PET Plastic clear cup for any cold beverage. They are pretty sturdy and look nice, and are recyclable. We use them for iced or cold brew coffee, but they'd be great for beer, water, or soda as well. These cups come perfectly packaged, They are of very high quality . perfect for cold drinks. much stronger quality then other brands. they come packaged 50 in 20 individual bags. I've received cases missing entire sleeves of cups, now I noticed there is not 50 in a sleeve like stated on packaging. So how many cups have I been shorted over a year, because I can't afford to pay someone to count each and every sleeve in a case. This is absurd. I understand things happen sometimes but c'mon. We appreciate your feedback! We’re sorry you did not receive what you were expecting. A Customer Solutions Representative will be contacting you soon. I really like these cups. Solo always impresses me with their products. They are exceptional. The plastic is very clear and very durable, so these can be reused a couple times if you'd like. We've tried several different brands from several different companies. The Dart Solo brand is hands down the most efficient for the cost. While you may spend a little bit more than the economy cups, you receive a much higher quality cups. We no longer have any complaints about cracked cups or the cups being too flimsy. HIGHLY recommend. Just wish shipping wasn't so high and didn't take 4-5 days to get here. Had to buy these instead of my usual Choice brand cups, but these worked just as well. The only downside was the sizing was a bit off so I had to get different lids too. We use these cups in our Cafe for iced drinks and iced coffees. They are very sturdy and the lives that come separately fit very nicely. Perfect cold cup that can be used for almost anything, water to beer to smoothies. Good quality, and they do not crack. Very economical too! We order these cups at least once a month for our iced coffees and frappes. They are very strong and durable for our uses for them. Dome and flat lids seem to fit very well. These cups are very good quality. They don't buckle when you fill them and handle them. Perfect for use in a restaurant or bar setting. These cups have a great ultra clear design and are good for a variety of cold drinks. The PET plastic is supposed to be unbreakable and better for the environment. Good quality cup! These cups are a great option for any juice or smoothie bar of cafe for that matter. Reasonable price for the quality. would recommend to others. Great replacement for our previous cups from a different company! Sturdy design and good material, I haven't had any issues with these. Our dome lids and flat lids fit tight and prevent any spills. 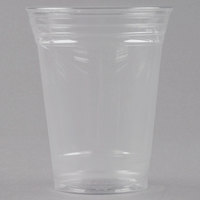 These cups are a high quality clear cup for restaurants, bars and parties. Crystal clear is more expensive than translucent but sturdier and looks classier. Not much to say. This is a good cup for cold drinks. Sturdier and doesn't crack easily. I will continue to buy these for drinks in my bakery. Awesome product! Very sturdy cups. Matching flat lid fits very securely. Make sure to double check that you are purchasing the correct dome lid for this product, the compatibility was a bit confusing. These cups are great for our iced drinks. They are sturdy and the lids fit securely. From time to time we also will put a kraft sleeve on them and it works great. These clear cups are strong and look very nice. I made the first mistake of buying the wrong matching lid size, but this company is great and very professional with their returns. Good multi use cup at a good price on this website. We use these for everything from slushies to soda to beer. They are clear durable and strong. We use these for our mobile, cold brew coffee business and they are great! We've never had any crack! Our customers have complimented us on these cups numerous times! We're very pleased! These cups are real durable and hold up well with all of the cold drinks we make in our coffee shop. We can use the flat lids or dome lids with it depending on what drink is served. These are great "to go" cups and we use them also for kids drinks (with the lid on it of course). We like that they don't have the stuck together issue that many plastic glasses seem to have. Will order again when inventory is low. I love using these cups! They are crystal clear and they are made of a nice sturdy plastic. I absolutely will be buying these cups again! The cups are not super clear. It is transparent but it has that dark tinted color. The color looks almost like clear water and a drop of blue ink. However, the cups are very firm and does not bend easily, which is good enough. Great cup to hold our juices and smoothies. It's a sturdy cup that works well and easily fits in to the hands of our customers. I purchased these 16 oz cold cups to serve our cold beverages. They are very sturdy and works well in our coffee shop. Love these cups! Good strong cup and crystal clear as well! Some other brands have a cloudy cheap look to them, but not these great looking cups! Thanks for a great price too! I have tried so many cold cups for our coffee shops. Nothing works like these do. Nothing holds up like these. LIds tend to pop off with other brands where these fit snuggly and you'd be hard pressed to squeeze it off. Just be sure to get the companion lid by Solo or you run the risk of them not fitting. Trust me, I learned this the hard way. Purchased for a wedding. Bulk is defintely the way to go. Great prices too. I ordered the Squat cup to reduce the chance of tipping over. The nice cup, have not had any issues with breakage or sticking like the off name brands, Would recommend this cup to any coffee shop. A good sturdy cup. Perfect size for my medium size slush ids and drinks. Very versatile and you get a lot of them for the price you pay. I like this company a lot the make really good quality plastic cups at a good price, is the only brand I use at my shop. You can get Dart 16 oz PET cups at a lot a different places but Webstaurant has the best prices so you can just add them to you order with everything else and save on shipping. We go thru these cups like water. They are a good product. Top quality and when we have outdoor events or run out of glassware these are what we use. Ordering from Webstaurant is always a breeze. 2-day shipping is awesome. This 16oz cup is just like a picture - a clear plastic with a rim. A step above the cheap alternative, this is a good buy. PERFECT cups for serving my smoothies and juices at events. They're very sturdy and the perfect size and shape. I also am able to easily stick labels on them for serving. We use these cups for Sweet tea, juices and iced coffees and they work great. The solo lids fit very well and the cups are as sturdy as any we've used in the past. We experienced a couple sleeves that had several cracked cups but I'm sure it was due to the shipping company and not the manufacturer or Webstaurant. I would highly recommend these cups. These cups are strong and sturdy and bigger than the average cup that normally come with catering orders. They look a lot nicer than paper cups or small plastic cocktail cups. This is the lowest price I have found anywhere on these very sturdy cups. I had previously found cheaper cups but they were flimsy, tending to crush easily under the weight of the liquid contents. Be sure to specify "hard wall, PET" so that you get these stronger cups. we love this line of plastic cold squat cups. the hold up really well. and store very easy. and best part is just throw away and restock. great value to. Nothing more classic than a Solo Cup. These cups are nice and durable, rarely leak or split open. We have had great success with using them in our company. These cups are sturdy and a nice clean clear plastic. Layered drinks and colored syrups look both appetizing and artistic. They don't feel as if they will crush easily either which is a plus.